This time, I will have pictures from something other than a BlackBerry and cheap Wal-Mart point and shoot. 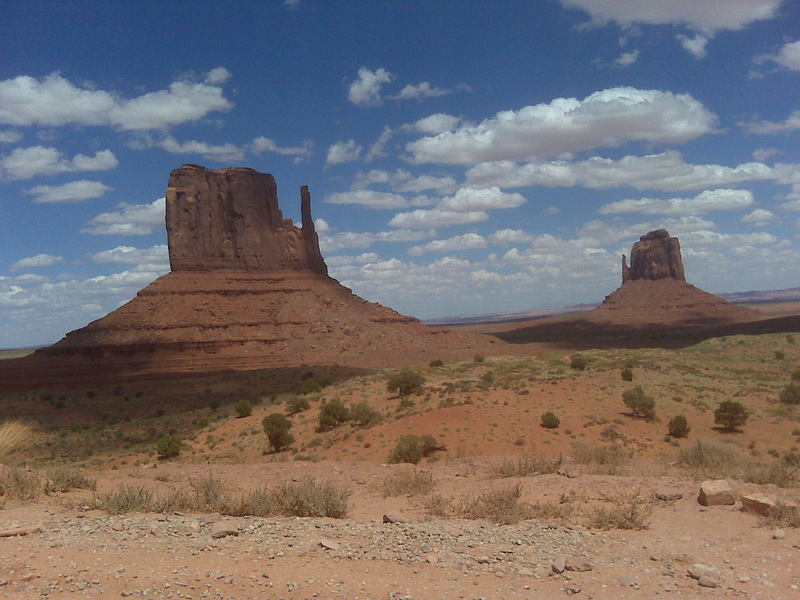 Still, this shot of “The Mittens” from Monument Valley in 2010 isn’t bad for a BlackBerry. Remember the time I said 2013 may be the year I start posting more regularly? That was a good idea. Too bad I’m failing miserably at it so far. I mean, I’ve been working — a lot — and keeping busy with life projects in general. Life projects including working on that Montana respite that I take off for in approximately 23 days, 8 hours and 11 minutes. I think everyone Lacey follows on Instagram has been in Montana this summer and every time I get on Twitter there are about 500 tweets of pictures from Two-Medicine Lake, some mountain or other or something else breath-takingly beautiful that I just can’t wait to see. But the best part of this trip: Barring some unforeseen disaster, I will actually have pictures — and good ones at that. Lets recount some of my camera misadventures, shall we? Flash back to 2010. I have recently purchased my first DSLR, a Nikon D5000. Its something of a reward to myself for just being me. So, I’m in the Scripps Program and just loving that I can use my fancypants camera at press conferences instead of the point and shoot our office had for us to use. Then, one day, I’m showing my family around DC when I walk off and leave my camera on a tour bus. I literally watch it drive away into the sunset. Even though I called the bus line almost immediately, of course no one ever saw it or turned it in. I replaced it some months later with the same model and haven’t had any mishaps since then, unless you count the time I dropped it down some steps on a miniature golf course in Panama City Beach a few years back. Go back a little further to the summer of 2010. I had a point and shoot camera that had served me well and set off with it on the infamous Gypsy Trip. About a day and a half into the trip the battery dies and no matter what I do, I can’t get the thing to charge. On top of that, I have some kind of weird battery that can’t be found anywhere but on Amazon and so I am just out of luck. Rather than spend precious vacation funds on a camera, I bought a $40 off-brand something or other from a Wal-Mart somewhere along the Oregon Trail between here and Colorado. It took pictures, but that’s really the best thing I can say about it. I had a lot of issues with picture storage on that trip as well. Basically the whole excursion was a technological nightmare. So this time, I’m going to be prepared. I’ve got backup batteries for my DSLR and video camera, back up memory cards, an external flash drive and chargers for the car and wall outlets. Come what may – I’m getting good pictures from this trip. And if all else fails, Lacey is kind of an awesome photographer. I’ll just rip off some from her. This entry was posted in Cowboy Hunting, Epic Road Trips, Montana, Vagabond Girls and tagged Cowboy Hunting, Montana, photography, technology, vacation, Vagabond Girls by Cassie. Bookmark the permalink.